Q05Shopping cart function is unable. Q06I do not receive any mails from le-noble. Q09What are the advantages of our membership? Q10How do I modify my personal information? Q11I have forgotten my password. Q13What is the "Addressee List"? Q14How do we protect your personal information? Q15How do I cancel my membership? Sagawa Express Co., Ltd. and Japan Post Co., Ltd.(Yu-pack) have fixed nationwide flat fee to ¥648 per parcel. 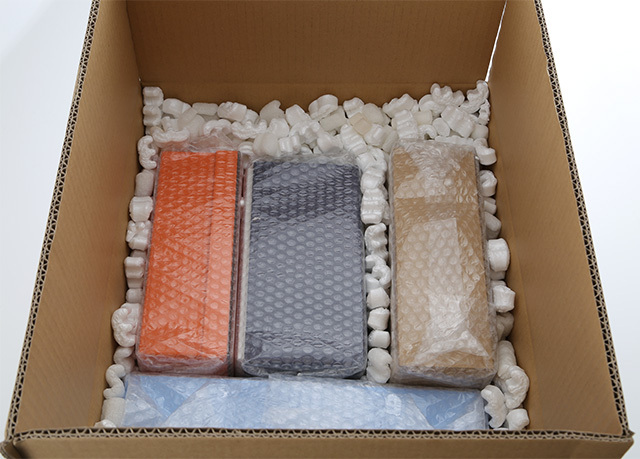 However, if you order over ¥20,000 of merchandise in total, without consumption tax of 8%, or handling charges, the shipping is free of charge. From the time you confirm your order, the shipping takes usually less than one week, except for out of stock products. The overseas shipping is provided by Japan Post Co., Ltd. (EMS) and the shipping fee varies with the weight. Complete first your order with the purchasing form, and then, the fee and the stock availability will be communicated to you. Please, refer to this site for the shipping fee. Track your order via EMS. Our standard export packing is as below photo. For online transactions, you are requested to use UnionPay and Credit Card. The credit cards which we accept are: Visa, MasterCard, Jcb, and American Express. Although we are committed to provide the best quality of our products and its shipping, mistakes may occur in quantity, in quality or in product. Those products are returnable or refundable only if you inform us the order number, your name and the reason of return/refund within one week, and if returned products are not out of stock. As soon as your order is sent (see the sending confirmation mail), the title of the product is transferred to you, and you are consequently responsible for any loss, damage or any other harm to the products. Open immediately your parcel, and if you notice any harm or damage, you have 7 days from the arrival date to contact the carrier. Likewise for glass products; the small bubbles inside the glass, the warp, the balance, the size and the thickness are not similar. We are able to make a gift wrapping at free of charge. Please check the blank box of the purchasing form if you need. *Please note, depending on the size of the products, some items may be unsuited to a gift wrapping. Activate "Cookies" and Java Script. "Cookies" and Java Script must be enabled in order to shop. Please refer to support page of your web browsers. Please verify your registered e-mail address. It may also be due to your mail user agent, your provider, your security software or free e-mail service – such as Hotmail or Yahoo – which considers our e-mails as a spam. The consumption tax will be exempted for all overseas deliveries. Either in Japan or abroad, Noble Traders wholesales to restaurants, retail stores or corporations. Among Le-Noble original gift, tableware from the whole world, the highest grade of porcelain "Bone china" and much more items, you will certainly find what you were looking for. Do not hesitate to contact us. It would be a pleasure to help or to advise you! * For inquiries regarding the B to B business, please let us know first about the details of your company profile, type of management, URL address, and your requirements. Creating "Addressee list", consulting your purchase history, subscribing to our newsletter, and much more advantages. As a member, whatever your registration method (Internet, E-mail, Phone or Fax), your personal information may be freely deleted, modified or (un)disclosed. Please log in “My page” and choose “My Account Menu”. Reset your password with the appropriated form, or contact us. The newsletter is sent only if the subscription via "Registration member" form is completed, otherwise, e-mails notification or newsletter will not be sent. Instruction for cancelling your subscription is mentioned on e-mails, and no more newsletters will be sent after cancelling. Feel free to contact us to share your reason of cancelling. Creating an "Addressee List" saves you from entering each time your or of your friends information. We are committed to protecting your privacy. Please refer to our Privacy Statement. Please log in My page and choose “My Account Menu”.